How Does America Stack Up against Other Countries? When new social programs are discussed, such as free health care or free college education, there is a lot of discussion about other places in the world that already offer these programs — followed by quickly by a discussion of how much money people in those countries pay for taxes. The consensus is usually that people in those countries pay a huge chunk of their incomes — up to half — in taxes to fund those seemingly indulgent social programs. But what is the reality? The United States has the eighth highest income tax rate among the countries in the Organization for Economic Cooperation and Development, or OECD. The average person without children pays 22.7 percent of income to taxes in America. Belgium has the highest tax rate, and citizens there pay about 42.8 percent of their income in taxes. Germany is close behind, at 39.9 percent, and Denmark trails at 38.9 percent. Other countries beating out the United States include Hungary (35 percent), Austria (34 percent), and Greece (25.4 percent). New Zealand came in just below the United States with 16.4 percent, and Israel trailed at 15.5 percent. People in South Korea pay only 13 percent of their income to taxes on average, and people in Mexico pay only 9 percent. The numbers reported by the OECD in 2015 do not include information about how that money is spent, such as comparing the social programs available in each country. The United States ranks much higher for its corporate income tax rates. Among the 34 industrialized countries included in the OECD, the United States has the highest rate at 39.1 percent. However, when compared to all the countries in the world, the United States comes in third behind Chad and the United Arab Emirates. America’s corporate tax rate is much higher than the worldwide average. The average top corporate income tax rate is 22.6 percent, or 30.6 percent when weighted by Gross Domestic Product, or GDP. Europe has the lowest corporate income tax rates as a region, with an average of 18.6 percent, or 26.3 weighted by GDP. Africa has the highest average by region at 29.1 percent. Though those rates may seem high, the good news is that the average corporate income tax rates have been declining steadily in recent years around the globe and by region. With so much at stake with collecting this tax money, the IRS takes its job very seriously and will levy fines and criminal penalties for underpayment or failure to pay. 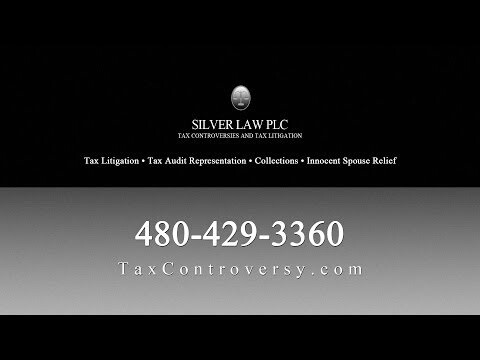 If you are facing an audit or tax litigation in Arizona, a tax lawyer from Silver Law PLC may be able to help you. By working with an experienced Phoenix tax lawyer, you may be able to reduce the penalties against you or have them dismissed completely. That could mean saving you a lot of money or helping you avoid jail time. Call us today if you are facing tax charges in Arizona and learn how we can help you. Where Does My Phoenix Tax Money Go?